Sorry for the long delay in this update. If anyone is still checking in. 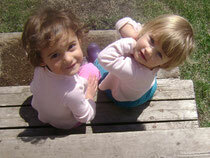 In past two months we have moved from Vancouver to our home town of Fernie. On April 19th I did a slide show for Fernie and it was one of the best nights of my life - very overwhelming. I have settled into life on land with out a hitch. I am so very happy to be with my family in my own home! Coffee and waffles have never tasted so good, my bed has never felt so comfortable, and watching the girls write with sidewalk chalk is as good as ever. The beauty of Fernie and the Elk Valley is a welcome landscape. I am finally home. Although I have put on the 25 lbs that I lost I feel lighter in my step. It's almost like my quest was a story that I read in the past. It's hard to believe that I made it to the start line, and even harder to believe that I finished. One of the best and unexpected results of my journey is people telling me how I have inspired them. I feel honoured. 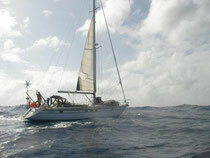 I had a very emotional goodbye to The Spirit of Fernie in Antigua and miss her greatly. She is up for sale and will help someone else achieve their dream. The thanks I owe are inumerable. Picture cards are on the way. We had a nice plane ride home and experienced minus 20 in Toronto on our overnight stay. I have been in the heat for 4 months now so this was a big shock! We had a tremendious greeting at the Vancouver airport with family and friends coming out to greet us. Thanks to all who attended it was almost like hitting land again. I have had a lot of questions about Chirp and want to let everyone know the story. Chirp kept me company 70 out of 76 days. This friend of mine would visit me 2 -6 times a day and would feed off the wake of the boat and turbulence of the paddle stroke. The flight of this bird was fast and agile using the wind to surf inches off the surface of the ocean. It was a beautiful sight to behold. The visits would last 10 seconds to one minute. Chirp disappeared on day 76 - the day I arrived in Antigua. Chirp was like a guardian angel! I have adjusted well to being back on land and have enjoyed every aspect of my trip. I even enjoyed the two week sprint that shortened the gap on Peter Collet. During this time period I slept minimally and rowed through many nights. I pushed myself harder than I have every pushed myself before! The ocean continually reminded me of it's power. It dealt me some hard lessons and even abused me at times. It also, allowed me to feel stronger than I have ever felt and closer to nature than I ever imaged. These moments were gifts and I know they will help aid me throughout life. I will be sharing these tales on the Blog over the next few weeks and showing some video as well. Thanks for being patient. I will be doing a live interview on Global TV News tomorrow morning at 8:20 vancouver time. Being in Antigua has been a magical experience for the Attalla family. We can not describe how friendly the locals have been to us. 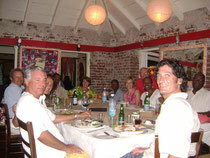 Scotiabank Antigua has taken care of our every need and gone above and beyond being courteous. From the amazing welcoming celebration complete with steel band, kid's cricket team, champagne, toasts, flares, singing, gift ceremony .... to a dinner at the nicest restaurant on the island. The company of these people is a true honour. They are so genuine and happy. Besides that the food was amazing and I can feel myself putting on the weight. They have even offered to take care of shipping my oars - which in and of itself has been a journey. Another thank you. To our new friends Brian and Donna Goring - we sincerely appreciate all of your help in assisting us getting sorted coming to Antigua. And, once here what a welcome at the party, you booked a fantastic band and came with horns, blowers, shakers... Nic also loved the book you wrote Donna " Dancing in the Dining Room" . It added a lot to the culture of the trip. Brian, thank you for chauffering me around errand hopping as well. It was really great to meet you. During my journey Jon Turk author of "Cold Oceans" , " In the Wake of the Jomon" , to name a few, helped with invaluable weather forecasting. Besides weather facts, Jon is no stranger to be alone, cold, and in a hostile environment. He was able to give powerful encouragement when I most needed it. Thank you Jon. We return to Vancouver on the 29th midday, and within a few days will be able to link up video clips from storm days to underwater footage of dolphins and whales. Thank you for continuing to check in on my solo endeavor. Hi everyone and thank you for your support. I am well rested and have not let my girls out of my sight. I have spent a lot of time getting the boat fixed and I am happy to say that the leak is fixed. The problem was from the dagger board box - there was a seam that was sealed with silicon and this is where the water was getting in. The silicon did not hold up to the salt water and 80% of it was eroded. It was a simple fix replacing the silicon with an epoxy resin which was done by Slip Boat Yard. A special thanks to a few people who made my arrival special. Thanks to Brad Kitchen (the captian of SKAT - you would have to see it to believe it - a 360 foot yacht made to look like a warship). Brad motored my family and friends out to sea to greet me before I hit shore on race finish day. Thanks to Richard, Bettie and Nathan who helped in too many ways to mention. Thanks to my Brother Peter who was very helpful, especially with the boat repair, but was noticably disapponted with the fact that Aniqua has no surf. Thanks to my mom and dad who besides greeting me with love and care cleaned and packed the Spirit of Fernie. My dad is on his second fishing rod and has not caught any fish yet but is at it every day. This morning I paddled him around in a two man kayak and we trolled for 2 hours. Luckly from my point of view we did not get a bite or for sure we would be swimming. Thanks to Nicole who cared for the kids and worked harder than anyone, she is amazing and I am so happy to be on land and to be physically a part of the family again. Thanks to Scotiabank who gave me a heroes welcome and I will never forget that. Food has never tasted so good the barbeque here is out of this world and the people are genuine and friendly. Today is really the first day I've had a chance to reflect on the events of the past few months. I will be updating stories from the sea and here in Antigua shortly. 1 # of very sore buttocks. Paul is recovering well and can sit down through meals and more, but when he first landed, it was hard to sit down. But he's happy to be sitting down without the constant rolling motion and without the constant sound of the wind in his ears. 4 # of sharks that swam and swam around the boat. Sharks are lone travellers, so that's four separate encounters! One of which came about an hour after Paul went under to clean the hull of the boat!! Timing is everything as they say. 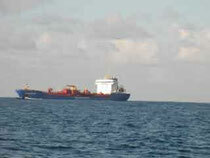 6 # of close encounters with freighters which reluctantly and eventually moved out of Paul's way. One of which he felt its deep tremors on the water as one freighter approached right on his bow before it agreed to change their course. Most of the captains would not believe that he was actually a very small ocean rowing boat and one captain thought he was a refugee from somewhere. Paul inadvertently shot a flare at one of the freighters (protocol is to shoot in the air). He panicked and was quite frightened because it was getting way too close for comfort, and with trembling hands he shot the flare. Paul alone could have started a naval warfare in the middle of the Atlantic! Canada vs ship of unknown origin. As some teams were nearing Verde Islands off the coast of North Africa, Spanish fighter jets buzzed them thinking they were refugees from North Africa to the Canaries. It confused the pilots because these small row boats (loaded down with solar panels and high tech equipment) were all going in the opposite direction from Spain out to open sea! High Tech Refugees. 56 # of lbs. of Longview Beef Jerky consumed. A huge thank you to Longview Jerky Shop for the world's best beef jerky! It became one of the comfort foods that helped sustain Paul throughout the entire race. Fund raising for Solo The Atlantic. Solo the Atlantic is inching towards the $200,000 goal thanks to the donations but we still need your help. Fund raising for Solo the Atlantic will continue with contributions starting from $10.00 and upwards which will be gratefully accepted. This race has been an inspiration for Paul Attalla. He calls it “life changing” and he will continue to share his experience with the readers who also have been inspired by his amazing feat. Check out the Mini-Movie of Paul's arrival in Antigua below! The Vancouver Sun printed an article on Paul this past Monday morning. Due to the poor phone connection a few points were made that were inaccurate. We would like to clarify these at this time. Paul was in no way assisted in the race regarding dropping off provisions from Woodvale during the race. This would have meant disqualification. He did not require any support. 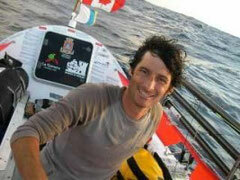 Paul is the first Canadian solo in this race, and the second Canadian solo to cross the Atlantic, not the first Canadian to cross the Atlantic. However, Paul is the fastest Canadian to complete the crossing. We would also like to thank our gold sponsor Scotiabank which was not mentioned in the article. We are unable to make calls from the island and our internet is limited so we apologize for not calling or contacting friends and family. Peter Collett on Charmed Life did not take the antibiotics that were given to him by the support boat two weeks ago. Because he did not open them, Paul decided not to protest the support. He finished 15 n/m ahead of Paul. Just to let you know Paul is in good shape. He is walking incredibly well and won't let his three girls out of sight. Paul got the third fastet time in the racers/independent projects for the Canary Islands to Antigua crossing for solos. Way to go Paul! We also think he broke some kind of record for distance covered in the last few days. During Paul's two week sprint to the finish his 72 mile day may be a solo record for 24 hour mileage. 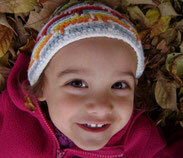 Today at 8:38 Toronto time Paul will be on the Heather Hiscox program on CBC . As well in the Vancouver Sun. 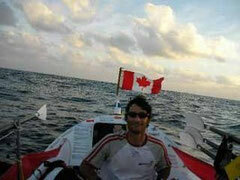 Paul Attalla arrived in English Harbour to the largest welcome received by a rower of the Atlantic Challenge Race 2007 on February 16, 2008. As nightfall set in at the dock, Paul waited around to welcome in the Barbara Ivy women who arrived about 4 hours later. While waiting, Paul had his first real food—Antigua pizza and beer! Amazingly enough, he walked around for most of the time, as his slimmed down legs felt the ground looking for a balanced walking stride. What’s Paul doing now? He's giving interviews over the phone. CBC Newsworld will be on live in a few minutes in Toronto. With his father Moe, his older brother Peter, and friend Richard, the clean up of the “Spirit of Fernie” has begun. Under the baking Antigua sun, the four worked for most of the day on Sunday, pulling all the gear out of the boat along with plastic jugs of ballast water. The cleanup will continue for a couple of more days. Paul would like to thank every one of you who have been following his progress as well as all of the encouraging and heartwarming messages on the Guest Book. 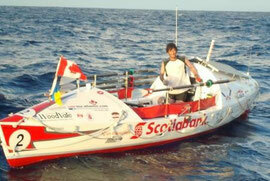 It fueled him to row even harder and faster to complete the Woodvale Atlantic Challenge from La Gomera, Canary Islands to English Harbour, Antigua. As seen on the “trailer”,at the end of his video below on this page, more video images to come. Stay tuned. Paul has some interesting stats to share which will be posted over the next few days. Some stats, you may already know, and some will be mind boggling. Another night full of excitement as I was almost hit straight on by a Russian freighter. 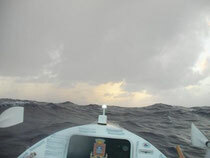 Once again I let the ship know that I was a VERY SMALL OCEAN ROW BOAT: only to hear their groggy replies " clear the way". Eventually they sensed my panic and WOKE UP! The whale is still with me. It is quite shy but meanders back and forth between half a kilometre and 200 metres bobbing up and down behind the boat. Coincidentally or not, I have sad news that I have not seen Moby in about four days. My little buddy Chirp still visits 4-5 times a day and he/she always puts a smile on my face. It was very nice to talk to everyone at Scotiabank Tsawwassen branch today. Talk about a team. Nicole was in doing some banking and one of the ladies came up to her and asked if she was Nicole Attalla. They proceeded to tell her about posting my blog on a bulletin board and showed her t-shirts and how they follow the race. What a great group that definitely made my day! I can't wait to come and meet you in person to thank you! Thank you so much for all of the motivational words, I have such a great group of old and new friends. Today the waves were choppy and coming from the North, amazingly powerful for their small size. Chirp only came by for a visit once today. He/ She must be finding something more interesting than me now that we are closer to land. A grey whale followed me all day. I kept seeing its shadow underneath the boat. I don't think it was the same one as a few days past as it was not as curious. Beautiful creatures. Almost one month has gone by since cousin Amy and Joel had little Eliot Darol, named after one of my favourite uncles. Huge congratulations and we can't wait to meet him! I want to thank all of the families and friends who have helped Nic and the girls during these last three months in Tsawwassen. She can't praise you enough and wouldn't have been able to do it without you. Especially the immediate family Mom, Dad, Moe, Elinor, Carla, Pete, Mitch and friends Ali, Non, Shawna and Fiona. Today was a jackpot day! I owe it to BP (Brett Price) . After surviving 71 days without coffee, I found the only small packet on the boat of - liquid gold - COFFEE! I will treat myself tommorrow morning. I don't even know if I'll be able to sleep tonight I am so excited. Yesterday I had was a little grumpy so I watched a comedy sitcom and had a snickers bar and that helped. I am definitely yearning for land, family, food. The finish is definitely on my mind and I am playing in my mind the parties I will have! The last two days have been the most memorable of the journey so far. bigger and a cross swell was about to collide with it making it even bigger. stopped I think it would have been very hard to start again. 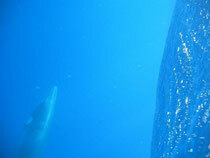 This is the grey whale deep below my boat - school bus size. Today I watched as two storms collided in front of me. I fought hard to not be pulled south again. I make it a rule to keep my camera on deck now. I thought I saw something and then perhaps it was my first hallucination. But not an hour later, right in front of my boat was a giant grey whale! It was the size of a school bus and hung around for about 45 minutes right beneath my boat. What a thrill! Such a magnificent creature, I will never forget it. can not last forever. I hope it lasts 14 days. water but the faster pace does make one long for land, family and rest. Emily I am so thrilled for you. You have reached a lifetime goal! You are the best in the world right now. Amazing! I am rowing so hard. It seems to be paying off. Chirp and Moby are still with me. I worry a bit about Chirp. He is from Europe or Africa I think and may be a ways from home now. Moby will fare well I think. Nic wanted me to say we have the best bank in the world and we do. Thank you again Scotiabank for being my gold sponsor. Nic would like to say you are the easiest, most flexible, greatest online and telephone service bank. I guess she was in the Tsawwassen Branch and both girls were crying and people were coming out of their offices to bring toys, and see if she needed help. Wow, now that 's service. Joy told me a knew meatballs joke. It goes like this: Meatballs on your boat Daddy. We only have 9 more sleeps till we come to Tigua to bring you home Daddy. I am counting the days til I see everyone but of course staying focussed on the task at hand. center. It is kind of like a GS turn combined with swinging in a hammock. This happens about ever 20 min and it always makes me smile more! I feel good and am rowing as hard as I can! These last 48 hours have been slow moving despite my extremely hard rowing. At night I usually drift 10 or more nautical miles and I have only drifted 8 nautical miles. A hard day to try to stay north but nothing like what my competitor Pete - A Charmed Life is going through. All I can say is Pete I am praying for you to stay strong for the support boat with the antibiotics to arrive. I can't even imagine how you must feel right now but please know that I am sending every bit of energy that I have your way for safety, healing and a speedy recovery. it for 5 hours. I think it is behind me now but what a wild experience. Complete magic today as a pod of 50+ dolphins splashed and played all around me. They would jump 3-4 at a time in unison. Some had black spots on them. It was so beautiful. I have not seen them for over a month and this many at once was awesome! Today was a perfect rowing day. Great rowing conditions. 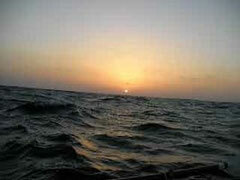 The ocean was unorganized but this makes for favourable paddle strokes believe it or not. Whilst cleaning up at days end I got hammered by a big wave and I was perpendicular to it, a bigone, just to make sure I am on my toes at all times. I had the biggest scare today, opening one of the hatches and it was completely full of water. I think it was the way my lifeboat was resting on it so the next few days will tell. I really look forward to my daily phone call to family as I realize my speech is starting to suffer. I am singing aloud but really it takes practice to keep words flowing easily. Something I didn't know before the race. Also I've started dancing. I realize that I haven't walked in over 50 days and figure it'll be very foreign by 80+. I am starting at "Blue Rodeo" pace and hope to work my way up to "Teen Spirit". A special thank you to all of my family in "The Soo", too many people to mention are following me, for your wishes and notes on the guestbook. Also a big hug to a special cousin Sarah who has been on Nic's facebook and my blog since early last year rooting for me. One of my favourite memories was last summers White/Wilton family reunion where I was able to meet up with cousins, aunts, uncles, and their children where my Mom grew up. We had a blast with t-shirt painting, family trees and visits, dinosaur forest, the duck races, gramma's strawberry pies and hanging out on the beach with the family. Yahoo for the Soo! Well I got myself psyched for it and under the boat I went. It makes me so nervous and expends so much energy so the blog will be short tonight. Cleaned the boat and said a quick hello to MOBY - he says hi to Mrs. Scott's class too. A very hard day with no wind. Beautiful, but you work for every mile. I am beat tonight. I hear I missed Steve's birthday party tonight as I've missed many events, one of the down sides of this coming at reality. Happy Birthday to all of those who have had special days while I've been away. You are in my thoughts and I sure wish I could be sharing birthday cake with you. I'll sleep well tonight. There was something close by all night, as my seame was going off and wouldn't stop. No answer on the radio when I tried to call them either. Let your imaginations run wild! Ogopogo, Pirates, another competitor stealthily trying to pass me? Likely a sailboat and everyone aboard was asleep, or perhaps another foreign freighter that I couldn't see and they didn't understand my sleepy mumbling English. Anyhow, today I sure could have used one of Moe's turkish specials. I am so excited as I have been hearing about some friends and family coming to the finish line. I had a dream that I finished and no one was there, and then I went to the airport and no one was there either. Now how's that for Paul pressure. My computer is starting to not work, I can forsee the big blow about to occur so anything you want to tell me via guestbook, now is the time to do it. 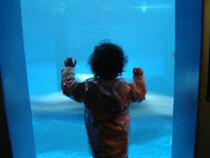 I received the cutest email from one of my daughters Joy today and I wanted her to know that we can go to the Aquarium when I come back and we can buy dolphins in Tigua with the money you are saving too- but we better get one for Amy too as I am hearing that anything you like - she likes too. 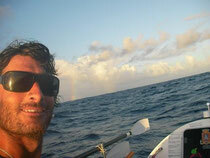 As I am typing my good friends Ben and Orlando - Team Row Commando will be finishing. I am so excited for you. This is an amazing accomplishment and I will be celebrating for you on my boat tonight. Thank you to the two of you who helped me in inumerable ways with your skills and determination but especially as friends that I will remember for a lifetime. To you my friends! One day at a time. I am feeling better, not in agony anymore and slowly but surely making it towards Antigua. Thank you again for all of your support on the site. If it were not for the team friends, both old and new, and family this trip would not have been possible. It is an experience of a lifetime that I can not wait to share with you all. Thank you also to all of the different media who felt that I was worthy material for a story. My wife just informed me that there are several online links that are now in the media section of the website, with more to come. No real news today so that is probably a good thing, I know sharks and tankers add to the variety and excitement, but a pretty quiet day today.and I am thankful. Over 1.3 billion people in developing countries make ends meet with less than 1 dollar per day. Well done Finished Business! Anyone who does not know these four women at various times competed in this race prior and were forced to stop due to shark attacks, capsizes and injuries. They joined for this years race as a Kenyan, 2 Americans and a New Zealander to complete some " Unfinished Business" and have broken records doing it! I was almost hit by a Russian freighter , or had a close call last evening. Fast asleep and my "Seame" alarm rang. 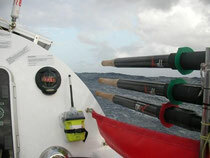 I got on the radio and state that I am an ocean row boat so to please change course. What I hear in return is to change my course. I proceed to tell them that I am drifting at a speed of less than one.... They still in barely English tell me to change my course. After a few more attempts and loud panicked begging, state that they will change their course. Phew! Another close call. These are the hazards of being a row boat. I heard another team had the same problem, communicating that the had NO MOTOR! Another very rough day on the backside. I can not sit on my bottom so other areas are very much in pain. I do hope for the waves to calm so that I do not continue get slammed by side waves. First off A huge Congratulations to No Fear and Team Gquama. Amazing accomplishment to last a lifetime. Especially to Nick with whom I struggled through the Master Yachtsmen math section with. You did it Nick!!! Today was definitely a better day. I am sorry to see that others are also having such a hard time with the weather, broken oars, wet-wet-wet issues. I am sending Pete all my best wishes so that he can hang in there to finish the race. It is so tough to have come this far and to be going through such rough times. The bottom side is in trouble now, continual wetness is not good. So today I washed everything and hung it to dry. It got soaked soon after. Hopefully the next few days will bring some drier weather. A fun interview today on CBC Newsworld. I was in much better spirits to begin with but it surely elevated them . You never know out here. Thank you ! I got a great shot of some of the school of fish underneath my boat today. Love my camera. I can't wait to do a slideshow with the pictures and videos back home. A rough day today as I woke up and cut my heel on a hose clamp ( bad spot to have it) and was bitten by a school of fish under my boat. I guess it serves me right for throwing my leftover meal overboard, but it hurt and I have two puncture marks to show. I paddled hard sideways all day and was soaked by big waves as I struggled NOT to go to Brazil ( no offense Thays - Terry my locum's wife), I'm sure it is beautiful. As a result my bottom is extremely sore from the gritty salt chafing. I talked to the CBC interviewer to prep for tommorrow's interview and reminisced about the race, family and friends, my great life, job, town... I was devastated after I hung up. Couldn't even row and wanted the race to be over, so I stopped. Had a protein shake, listened to some Simon and Garfunkel and got up to row again. Minutes later I saw a BIG wave coming and braced myself. It thundered down, the boat tipped, and self-righted , and I didn't go overboard. I looked down and my oar was broken. One of my unbreakable oars that I have used since the race start. You have no idea. Putting a new oar in hand feels so foreign, and besides chirp these oars are my best buddies. I almost cried. Once I got up I realized I was pretty battered up too. Today was an upsetting day and I went through so many levels of emotions. A good time to think about my charity. I would like to post one Human Rights fact a day. I hope to have some specific Canadian ones but for now here are some worldwide Human Rights facts. These are taken from the Human Rights Cyberschool factsheet. Some 160 million children are moderately or severely malnourished. Some 110 million are out of school. A rugged day today, but fun! A lot of wind and it rained for half of it. I have never seen rain like this. Sheets that flattened the sea (and soaked me) . For the first time I was cold- really cold. My favourite part of the day was eating my EAS protein bar . Thank you to them as my sponsor. I would also like to thank all of those who have signed my guestbook who I have never met. It is so amazing that you are following me. It means so much and I hope to meet you to thank you one day soon. I talked with the Commandoes today. Some of you may remember them from my early blog visits to the UK. Ben and Orlando are Royal Commando Marines. It was so nice to hear from them. They have had their fare share of excitement during this race as well and expect to finish in about 9 days. I wish them all the best and wish I was at the finish to celebrate with them. Brutal winds today. I may miss Antigua altogether and end up in Brazil. I am being pushed hard south for the next 96 hours or so. Saw a shark today. Wasn't sure if it was a dolphin or a shark until it circled underneath 5-6 times. I could tell by the quick jerky movements exactly what it was within seconds. It is amazing how they swim. A reason to celebrate today is that I should have enough food to see me to the end. I counted 26 food pods (thanks so much BP), and at least 10 more emergency rations. I know the family will be happy, especially my dietician who has been trying to put weight on me pre/during/post all of my endurance races. She has worked extremely hard to select specific foods that I would be able to tolerate in my mountain bike races, packed some special ones for this race and apparently already has a bag of comfort high fat foods packed in suitcases for Antigua. She'll have her work cut out ahead. I'm fortunate as I'll have both her and my Mom and Dad cooking for me post race. Unfortunately I am still having computer problems so we'll see about those after photos of my makeover. Well, another hard day of rowing as there was no wind today. Probably a lot of days like this are not too healthy, but I am still loving the challenge. I don't mind these days as I get a chance to daydream and relax a bit while rowing hard- if that makes any sense. As you can see from the photo that the skies are blue and the seas are calm. No sharks today either. I may be having computer troubles as I am trying to send the AFTER photos of the makeover and they don't seem to be going. I'll try again tommorrow, and leave you hanging for now. Seems I've sprouted a few well earned grey hairs in my beard from the days I went under to check the leak , tipped the boat in stormy weather and almost got hit by the freighter, simply to name a few. I will sleep well tonight after a long day working hard under the hot sun. Woo Hoo!!!! Passed the halfway mark today and I am definitely going to celebrate tonight. I have a FAMILY sized pack of Maynards wine gums, my favourite candy. I think I will indulge and eat them all. Today was a row hard day again, no wind, all work but I think I made some good progress. It was a calm day and I usually see sharks, so I kept my eyes open, but saw none. Thank you so much to Paul and Heather and Lee for the medical care package for Antigua, I'll definitely need it. Today it rained, no poured for 50% of the day. It is hard to rest on these days as I don't want to go inside and get the cabin wet. But the upside is 50% of the day was sunny. Thank you to Mrs. Scott's class for naming my fish. I love the name! MOBY my companion fish- how perfect! Thank you. Today the support boat came for a visit. It was so nice to see them. Under I went to check out the bottom of the boat and to see MOBY up close. He is not the nicest looking fish, but friendly enough. The bottom looks nice and clean now. Thank you to all of you for your messages. Did I say I love them? I think I will go and look for an evening treat. It's getting to be slim, very slim pickings now, so I hope I can find something. It seems as though plans are already underway for Antigua, I am getting excited too, but know I still have a ways to go. Solid day of rowing today. The morning started out calm with no soakers. settled even more and a pleasant day of rowing came to an end. As good as it gets out here. The photos are from the end of the day - it was relatively calm so I was able to take a few photos of what I look at all day. the friends I enjoy it with. who I think I am? A great day rowing today. The wind was strong from the east and the swell was medium size, not breaking, so relaxing was allowed. Big news of the day is that a FLY came by to say hi. I kid you not. In the middle of the Atlantic, a fly stopped for break. However, the fly did not stay long. good idea but down the hatch it went. look forward to mid morning. Mrs. Scott and her class, thank you for following me. 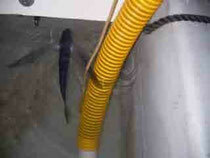 Could you please name my fish living under my boat. See the picture below to view it. Chirp kept me company for most of the day today. He was hovering. I also saw whales. Not sure what kind, white and maybe pilot whales. They weren't belugas though. My morning started out with my opening the hatch, leashing up and crawling on all fours to the front hatch to get my seat and cushions then " WABAAM". Another soaker wave, my morning wake up. It's still a few hours until the sun wakes up so this is the coldest part of the day. Today I rowed most of the day for the Gutzmans. My heart goes out to them as Jenny rests in the hospital and Kirk at home in Fernie . So hard to be apart but so important is your job to just try and keep that baby in there. We are thinking of you and having gone through it ourselves, know the scare when things are happening too early. 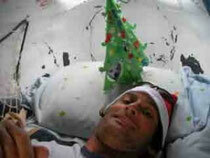 Hi to all of my friends and thanks to Brett and Nicole for having Nic over for what sounds like such a nice time. I can't wait for tenderloin myself. Over the 1000 mark! I decided to celebrate with some peanut butter and beef jerky, even though I didn't much feel like celebrating. Motivation is somewhat low at the moment and it seems even the little things frustrate me. I know I will snap out of it soon. The storm never hit and I am happy for that. The next one that is forecast might not come, it is still seven days away. I will pray and hope for good weather. The bottomside is getting sore these days as well as some other unavoidable issues are getting harder to deal with but that is just today. I'm sure when I wake up it'll be a better day. Hopefully I won't be greeted by a big soaker wave again. Thank you for all of your 1000 messages! I miss you all and needed them more than ever today. pitching out and throwing . This made for large booms and long rumbles. down and became less intense. could ride them easily. These conditions are fun to row in. notice. They are truly amazing creatures. sucked on peanut butter - heaven. Joy is missing Daddy a lot. We are Buddies! It is so amazing to hear her tales of ongoings with Nic, Amy and Grandparents. I guess they have all really had some special times and I am thankful for that. Grammy has a map and dolphin stickers to chart daily progress and does ballet and playdoh , Nana checks online several times a day and has the best playroom going, Grandpa Moe is weather advisor and the best Dad for advice, and I know Grandpa Nick is making sure Nic and the girls are safe in their house and probably babysitting a lot too. Today Nic told me the she saw a waterfountain for the first time that had coins in it and so Joy made a wish, and then another and one more. She kept telling Nic " it not working" . Daddy still not here. She then said fountain broken , we better go to " Tigua" and get him then. " Come on Mama, let's go! " That's my Joy. I am also really enjoying her sense of humour on " see-mail" (email) as she sees my pictures on the computer. She is amazing. This will be the hardest part of my journey, to be away from them. They are all doing amazing. Thank you to our families and friends for making the away seem not so far away. Today was one scary day. I have been fearful of getting in the water especially since I saw the shark a few days ago. Today was rougher weather but I have never seen a shark on a rough day so I geared up again and did not chicken out. I was terrified. Below me is 400 fathoms to the bottom and fish are swimming all around making the shadow of my boat into a shelter. I looked for the cause of the leak but saw no signs of damage. The leak has worsened slightly and I have underwater epoxy that I could use if I saw a dent or crushed area. Coping with the leak is a piece of cake, I now pump the water out two times a day and this takes only 10 minutes. Unfortunately I did not see a hole - or fortunately. I want to take this opportunity to Congratulate my locum in Fernie Dr. Terry Heras and his wife Thays ( tie-eez) and Dimitri on their baby boy Nicholas - love the name ( get in good with Dad # 2 after this trip). I am hoping you are all well and can't wait to meet him. Also to my friends Ben and Orlando on Go Commando, I hope you get your seat axel repaired for a smooth ride; and I am thinking of Niall on Komale and hoping you can give your elbow a rest to let it heal. All the best to you and thank you for your thoughts and wishes. Again, loving, the guestbook and messages. The storm has calmed and the sea is once again at peace. Today was a row hard day. No help from the wind, waves or weather, all rowing. I have had a lot of time to be thinking and Human Rights is on my mind. I look forward to posting a piece about this soon. Today Chirp came by and I got a photo of him/her. He/She moves so fast. He/She is at the tip of my paddle in the photo. This will be the second time I was attempting to go underneath and have a look at the growth underneath, and the hole (it's getting worse again). I am not kidding when I say I had my mask and snorkel on and was nearing the edge to jump in, and suddenly I saw a flock of seagulls. So, I stopped to admire them ( don't see them often all the way out here) and they flew right down to the water just above a sharks dorsal fin. The shark then swam up to the boat and under my paddle then disappeared. I am not sure how big it was as it all happened fast. I was taken back at how big the tail was and by the girth. I saw a fish living under my boat and I'm sure this was what it was chasing. I will have my camera ready tomorrow - I bet it comes back. Spirits and routine are good again today. My body feels fine despite a few issues that are inevitable with this kind of environment. Any time I get down on the boat I just imagine finishing and seeing friends and family in Antigua and I get instantly happy. I am so glad I have found something to make me feel this way. Thank you again for all of your guestbook entries. I love them and they inspire me more than you know. I awoke this am to a flying fish that had landed in my footwell! Of course he was set free after the photo. I am making some good distance today, but a storm and I mean a storm has set in. It is so rough I tipped sideways and it took about 5 seconds to self-right. I am happy I have the boat that I do. It is so rough I had to put out my drogue. It was very scary attaching the lines out of my hatch. I had to go over it in my head 5-6 times of how I would so quickly open my hatch, leash up, get on the deck, set it up and then get back inside my cabin again, so not to be bombarded by a wave. It happened anyways, huge soaker but I was alright and made it back in. A stormy night and some seasickness is inevitable. The blood is rushing now and adrenalin firing for sure! the wind behind them caused them to break and I washed a dozen times today. pickles please" Then wouldn't you know it sideways again. A fresh year ahead. Ahh, all the things I will do in 2008. Relax, take it easy, spend time with my family to name a few, did I mention my fireplace in Fernie yet??? Rowing was pleasant today as I get more and more used to the silence. My routine is row, eat, row, fix something, row, eat, get ready for night and blog entry. Pretty simple. My mind is becoming more relaxed and anxiety is less every day and focus on rowing and living on the boat is improving. I think one has to be very careful not to become complacent with the ocean. I take it very serious and take care with every move I make - I really do not want to slip and fall, or get washed over board by a sneaker wave. I make it a rule to be leashed to the boat at all times even on the calm days. I love it when Chirp comes to visit - I make a big deal out of it! He/she came by many times today, stayed for about a minute, then surfed the wind away. I have tried to get a photo but Chirp is very fast and is in constant motion - I will make a big effort tomorrow to get a photo so you can see him. 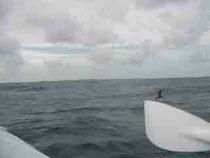 I am currently on a 2 meter swell with 1 meter cross swell and NE wind at 10 -15 knots. tell myself. The best thing about today was a recording made by Mark P. sent from Sean Cash (thank you) via IPOD. It made me smile and I listened to it many times. The worst thing about today was - nothing stands out, wrong, spagetti and meatballs (gagging as I say it) - I hate stepping in shin deep water in the morning as leave my cabin that always takes a little extra effort. Happy New Years to everyone. I have my party hat, confetti and horn ready to go! burning warm while playing with the girls and having Nic in my arms. Well I didn't have any trouble getting out of bed this morning with a wet cabin. All the more reason to row. I am slightly frustrated with no wind situation today. Didn't go very far but there will be more days like this for sure. 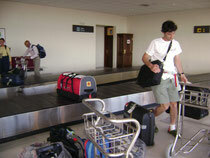 Thank you Paul, Jon and Richard for your calculations on estimated arrival in Antigua. As for wildlife, some have asked - Chirp is still visiting. I know I was in a bad mood today as he didn't show until 6 pm and I gave him heck, " Where have you been? Doing what? Like there is something more important out here in the middle of the Atlantic for you to be seeing? " I laughed anyways. I guess he wasn't too upset as he came back for another visit. Yes, I am lonely and constantly scheming what I will do with family and friends upon return. But spirits are still high and I just hope to get some miles behind me. Now to think about the New Year as its eve is upon me . getting chafed and thus had half my body out the back hatch near the rudder. not let go of pliers. I am getting ready for some tough days I feel them coming soon. garbage day story". I laughed outloud on an open sea. I think about the ocean and different looks on the face of each wave. friends like Mark C who believe in me and have helped me in many ways, Mike T, Mike G, Bette, Richard, Nathan, Pepper, Mike M, BP, and too many others to name them all - Thank you from the bottom of my heart! I wake up and it is still dark. I put on my surf leash, open my hatch, and step into my footwell. The hardest part is stepping into the 2 feet of cold water. I row immediately for 1/2 an hour to 2 hours depending on how I feel. I then break for my morning porridge (which I love). I take about an hour to clean up the boat from the day before; packing away any garbage and starting out fresh. I get my water in place and the row again for 2 hours. Next I have cold white tea on a break and lunch, whatever I can stomach for the day. I row a long stint now until 4 pm. Quick break and then another 1 1/2 hours of rowing and then eat dinner ( more boiling of water). I row until between 6:30 and 8:00 depending on the weather and the day and then pack it in for the night. This involves tying down the oars and various clean up jobs. This is my favourite time of day because I get to do phone calls and check my email from family and friends. I listen to music and drift off to sleep. That in a nutshell is my day. The next entry will be what I think about at sea! 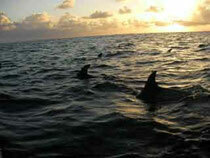 I awoke this morning to the sounds of dolphins playing, squealing and shooting water out of their blowholes. Joy would love it! I rowed as hard as I possibly can. About once every 15 minutes I get shot out of my seat from waves. My knees and shins are very battered from the oars hitting them midstroke, but I am not in pain. My hands although they look painful, are not, they are simply tough skinned 3-4 mm thick now. My spirits are good and I am loving the emails. Missing friends and family obviously. I am watching a lot of good movies. Today I saw my first pod of pilot whales. I had no idea some of them could be so huge, up to 20 ft. Yesterday I was in 6-8 metre swell, talk about adventure. I felt under the weather yesterday after eating some curry chicken but it seems to have passed. I look forward to opening my daily supplies. I get really excited if there are wine gums, sweet and sour chicken and chicken noodle soup. I am rowing as hard as I can. I figure if I keep this pace I will have only 40-50 more days at sea. Today I will open my pre-Christmas bag to see what the family has sent for me to decorate my boat with. I am thinking happy thoughts. The person who makes me laugh so much is - JOY and I am laughing thinking of what she is doing this Christmas season. I don't think too long and hard about it or I break down , but quick little thoughts make me so happy. Thank you so much for the guestbook entries. You have no idea how much strength they give me. Dave and Helen - wow! Thank you for your poem. Another boat coming to look for refugees?? I've had a terrible 24 hour period with very rare west west north west winds- watching hard earned miles slip by. The chances of getting wind in that direction at 20-knots for this month of the year is very rare. I had to use my para-anchor which is the equivalent of an underwater parachute 6 feet by 6 feet. 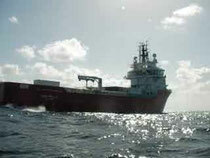 It is attached to 50 metres of line with a separate 80 metre floating TRIP LINE. ROPE CITY. If you screw-up the deployment of the para-anchor bad things can happen. It is a scary and very powerful piece of gear. I hope I do not have use too many more times. I miss my family very much and the bad weather luck for some reason has highlighted loneliness. I gave my self a classic Paul Attalla pep talk this am " Come on you have this rare opportunity in front of you, it will not always go your way, you have to flow with the circumstances, it is easy to be calm and cool and happy when things are going well but it how we take on the bad times that define our grit and strength, you can not change the weather, worry about things that you can change like your attitude; Missing the family is a fact of the race. It is only threeish months from many years of togetherness". Smiles once again - and once again the dolphins came by to say hi and play in the rough seas. But thankfullly the punchline changed to " Grandpa 3 fish! Let the mental game begin. It must be because the leak is under control (down to about 4L in 24 hours. Today I had every reason for celebration as I hit the current I have so been looking forward to. I felt a little under the weather. First time I 've really been thinking about things other than just the boat, course, weather, waves, dodging large Norweigen ships, sharks and survival. The current was noticable. You could see a distinct change in the water. It feels good. The skin chafing is starting to set in so thank you to Dr. and great friend Paul Michal for his amazing medical kit and advice. What a great guy, whether it is his expertise on crazy glue, labour and c-sections or any transatlantic needs, he is the one! But what I really owe him for is my sanity due to his incredible selection of music sent along via IPOD. Missing you all especially as I make phone calls and hear Christmas music in the background and salesclerks ringing up purchases. This will be a memorable one that's for sure. Today was a row hard day! It felt so good to not have to fix a thing. The support vessel " Sara" visited me today and took these photos. Stronger, but lighter for sure. I reminisced about winter today. The powder days in Fernie (thanks for all of the messages saying the snow is no good), sitting by the fireplace with the family and having coffees in the mornings with friends and playing with the girls. Antigua here I come! Amazing! I am having a great experience with the dolphins. They hung around for 30 minutes playing looking at me bumping my oars. I got some great video. 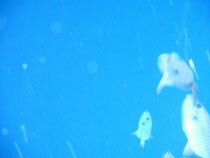 One of the shoots I am sending is with the camera under water in hopes that it can be put onto the site. The leak is still leaking but I can mange the water much better know. It takes me 5 minutes each morning and evening to hook up the pump. The hatches today were all dry. I now have my living space back and was able to store the gear again. It was hard sleeping with bags all around you and such. Power has been such a concern. If I have three days of cloud that could be it for power. I have all my water supply topped up incase this happens, and try to stay on top of electronic equipment use. Powering the computer takes the use on an inverter and this is a power pig. I am fortunate that my battery on the computer is 7 hours at full charge. I limit my movie watching to the evenings and am enjoying the ipod so much. Thank you Yaron, Sean, Tom, Kev and all those who helped to keep me entertained. Missing everyone! After speaking with Jon Turk for $100 dollars worth of satellite time and Tony from Woodvale I began operating on the space next to the dagger board. This space in enclosed with no hatch and is suppose to be a void space. If this space got filled with water it would explain how the the other compartments keep filling up with water - it is never an easy solution. Out comes the hand drill from the stone ages - and the first test drill is a gusher - I drain 50 plus liters of sea water, The second test drill is dry. 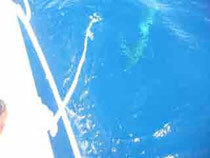 I steal some hose from a less important area of the boat. Hand drill 8 hole to make the diameter of the hose pull out this plug so it will not plug my proposed pump system. Epoxy the hose in place. Dance for joy at finally finding the source of the water. 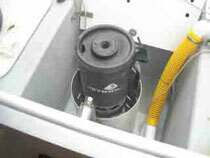 I rigger a billage pump to attach to the hose end and pump away the water daily. This is so much better than empting the cockpit area and hatches. So far so good - I easily drained 2-3 liter again tonight. For the life of me I can figure how this happened. I must have some damage to the underside of the hull in this area. I will have to wait until Antigua to see the damage - I am not diving in - saw my fist shark today at 8:00 am chasing a fish! I have a strange brown bird with white strips on its wings that visits me a few times each day. Each visit Chirp comes closer and closer. I will try to get photo of Chirp. And what I discoverd was some of my dry food had sprung a leak so it sounded like fizzing out firecrackers. Not dolphins, not a hole in the boat. I am stopping trying to repair the hole now and trying to figure out a way to restore gear and be able to drain leaky hatch every other day or more often if possible. Ruff day - leak still a problem. So after coming to the realization that the leak is here to stay and thus a tough start to my day I start rowing again. I've been hearing a lot of teams are hallucinating- well at first I thought I was too and then this is what came into view. A medium sized ship passed to the south of me by about 3 nm I kept an eye on it as my "seame" warned me it was near. I turned off my alarm tone as it becomes annoying and once the vessel is spotted it has done it job - or so I thought. After the ship passed by I began to concentrate on progress, move ahead, persevere and those type of thoughts. An hour goes by and begin to feel the water shake. I look at my "seame" light and it is blinking fast which means something is very near. I turn around and see this ship bearing down on me fast. I freak out and spring into action. The ship is going to hit me 1 - 2 minutes - it is coming directly at me. I leap into my cabin grab the radio and attempt to make contact while getting a flare ready with the other hand. I drop the radio thinking that they would not be able to avoid me even if they tried put my life jacket around my neck , free my life raft and grab bag and shot the flare AT the ship. I then heard a Norwegian voice on the radio as the ship applied the breaks hard. I guess they thought I was refugees or something of the sort. I was too happy to be alive to be mad. They all came on deck and took photos of me and me of them. After 10 minutes of exchanging communication they departed. I can not tell you how scared I was for 30 seconds. I cut my legs and head from moving around the boat so fast in damage control mode. Just imagine this naked guy with a life jacket around his neck and fireworks in his hand running around deck freeing a life raft. This would be one scene to rewind and watch if possible. Nice sun rise this morning I eat oatmeal then row for 1 hour before the sun comes up ...it is the loneliest of times on the boat - dark and wet with motion being forced upon you from unseen directions. Then the sun rises! I do this because I love to see the sun rise and my spirits lift. I also do this because if I row an extra hour every day then over 72 days I would finish three days earlier. This is definitely a mental race. My body is fine physically. I still have a leak no change despite my efforts. I dismounted the auto pilot compass and tried patching the holes with epoxy putty. Check again tomorrow to see is it helped? I hate living with bags all around me it drives me nuts - no organization. Definitely a test this race is. Thank you for all of the birthday wishes, they definitely lifted my spirits, especially when I saw the leak. >I want to dedicate my row today to team " Titanic Challenge". With the challenges I am encountering, I can not stop thinking of how hard your decision to stop must have been Andy and Jim. My thoughts are with you and I am so glad that you are both alright. I can not imagine how traumatic your journey must have been. Please know that you are so respected for your efforts and I am deeply sorry fo you having to stop despite all of your preparation both physically and mentally. Well I knew this would be exciting but did not expect what I encountered today. I have a leak that has let in approximately 200 kg of water. It is a slow leak and I am trying to detect where it is coming from. Luckily I have some epoxy sticks I picked up in the UK and spent about four hours patching around my electrical system. We'll see what tommorrow brings. I figure I should pick up a lot of speed once I get this one worked out. The weather has also been better so it has made it more managable to fix. Upon first attempt I had to unload all of my gear from the front compartment onto the deck and a wave came and swept some off. Luckily it was not my birthday package that my friends and famly packed up for me. Thank you all for the warm birthday wishes and messages from my guestbook as well. I am already looking forward to and thinking about Antigua. I will keep you posted on how the repairs go. Paul spent most of today repairing a leak into one of his storage compartments. Only time will tell if the problem is solved - a big worry. The weather has improved with less wind and smaller waves. He now has some appetite and has had two hot meals and hot porridge for breakfast. Paul phoned home on his satellite phone. He has had a tough week at sea. He has been very nauseated but this is improving. The waves and wind have made living difficult. It's been too rough to light the stove and water making is difficult also. We could hear the waves splashing over the boat. Paul said "this is not about a race this is about survival"but followed this up with "how many are behind me". Dolphins are following along and a sea turtle has taken a liking to his cleaning brush. Nicole, Joy and Amy are getting settled in Tsawwassen enjoying time with both families. Paul appreciates all your support via the web sites and is looking forward to his Dec. 11th birthday. Updates should be more frequent going forward. And the race begins. The Spirit of Fernie is complete. Thank you so much to Andy the German boatbuilder and his countless hours completing the finishing touches, Brett, Sean and Mike for all of the final errands and fixing up touches, and to the Richard and Bette for a wonderful post meal ´Pallea¨, champagne, salad and cake and Nic and the girls for decorating my cabin so beautifully with finger paint and glitter glue. Puppy and I will be very cozy. We had a lovely sticker posting party to place all of my guestbook entries onto the boat. The hardest thing I´ve ever done. An extremely emotional morning but thanks to Joy´s fantastic 2 year old inquisitiveness she brought tears of laughter to the morning with her comments. Daddy where you pee pee? There were some Canadians in the harbour and Bette´s Oh Canada was heard, fog horns blowing from Joy and Amy and a lot of well wishes from our new friends all around. There will be more to write but for now feel free to check the official race site: www.woodvale-challenge.co.uk for results. Thank you to all who have made my dream possible from the very beginning. I can not thank you enough. Scruitinearing 101 passed! The countdown is on! We are really feeling the crunch now. Some 16+ hour days of training and boat building. With Nic and girls running around for supplies and donuts, my great friend Brett Price spending countless hours scooping hundreds of spoonfuls of protein powder and coffee into tiny ziplocs and applying decals and me putting my house reno skills up to a new level working on the boat, I can see it coming together. We have not been lacking in excitement, and every moment brings a new challenge to tackle. The teams are all pulling together to help eachother out so we can finish before the start. Sharing of food, tools, a lending hand and some laughs and tears. Yesterday we had little Amy's first birthday in true Spanish style: seven layer cake, pinata full of rowboats, balls and candy and Spanish maraccas, tambourines and cards. We look forward to the arrival of our dear friends Richard Hayashi and Bette Terada and Mike Gardner. We have started race courses and meetings and I can feel the nervous excitement that comes with any race beginning! Well sorry fans it's been two crazy weeks here in beautiful Gomera. After a fantastic 12 hour power sleep upon arrival, finding an apartamento, and getting settled in general, I began to work on my boat. A few boat building hurdles arose; water maker, rowing position, oar length, position of bilge pump and other boat organisation made the to do list close to 50 items to be tackled prior to departure. Some pluses: Decals look amazing- nicest in the harbour (thanks Second City and Robb Gill). Getting to know my toolkit and boat mechanics could prove very useful at sea. I've received a lot of help from the locals who have welcomed us all with open arms. Dulceria crema donuts and Mary's smiling face, coffee condensa, la playa cuerva with it's beautiful black sand beach and gentle waves, and hearing Joy speaking the Spanish she's learned from Gomera and Dora. Took our first trip round the island today. One of the most beautiful landscapes we have ever seen. The diversity is amazing. Everything from desert to tropical rainforest, granite spires to basalt cliffs, oceanside beaches to banana and wine plantations all within minutes of eachother. Dramatic variation in the topography and vegetation make this place truly unique. No wonder it is a UNESCO world heritage site. We were absolutely awe struck. Today was a much needed break from rowing and problem solving boat issues. With two weeks left to go my focus is to pass boat scrutinearing, stay out of trouble while rowing, eat more donuts, and to make sure I'm home by bathtime and night nights. The trip over to La Gomera was a feat in and of itself. Before we hit the airport Nicole accidentally switched us out of bulkhead seats, then proceeded to drop our passports through the tiny slit between the gate arm and the airplane entrance falling 30 feet to a puddle on the tarmack. The flight to London was smooth - Nicole claims that she "did not sleep a wink" despite the fact that her eyes were shut 3 hours? The first eight hour layover in London was spent playing with trains and playdoh, eating Cadbury chocolate bars and organizing supply shipments. The next eight hours ensued with a very frustrated taxi driver speaking no English and the Attalla's praying we were going to the right hotel. We slept for 3 hours and then were not allowed any breakfast because it was 10 minutes early - we could see the food sitting there but were not allowed to eat any?. The next day we flew to Tenerife only to find our rental car was void due to no inter-island insurance, so we chartered a bush plane. After another 8 hours and some 5 coffees and no sleep later in the airport, we landed on a mountainside on La Gomera and rented a brand new car. After only 30 minutes of driving we crested the flank of a volcano and into view came the shimmering lights of San Sebastion, under a pink and purple sky. Nicole and I felt victorious with only 10 minutes to go as we rolled down the very windy hillside. Joy was excited as well and mentioned that she felt hot. Nicole and I dismissed this as meaningful information but did think it was odd as it was not hot at the time. Big Mistake! What came next was a vomiting session like I have only seen once before - Mike McLellan victory marathon. Not once but four machine gun projectile vomits in a 5 second time period. Her reply was "thats a big spit ...that's better"! We finally arrived at Hotel del Conde and drove around the same block at least 10 times before finally parking on the sidewalk. We got the kids to bed and slept the best 12 hours of our life. It's been a extremelly busy few days. On Tuesday, I stopped by Scotiabank to meet up with David Poole. He's Scotiabank's Senior Vice-President for the B.C. & Yukon Region and he kindly presented me with a cheque for $30,000! Great to have you on board Scotiabank as the title sponsor! 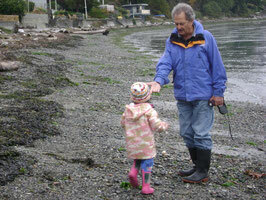 Dr. Don Nixdorf, Executive Director, B.C. Chiropractic Association joined us, and Dr. Nixdorf had a $5,000 donation from the association. I am so happy to have my first Chiropractic sponsor! Then it was off to do a round of media interviews, and Hallowe'en costume shopping for Joy and Amy. This will be my last Blog from Canadian soil! Things are really starting to get exciting. BUSY!!! We leave for the Canary Islands very soon. We are going there for one month prior to the start of the race in order to do some more open water training and have some family time. I just returned from my trip to Winnipeg where I had a virtual tour of the Canadian Museum for Human Rights. I was blown away at the magnitude and impact of this project. 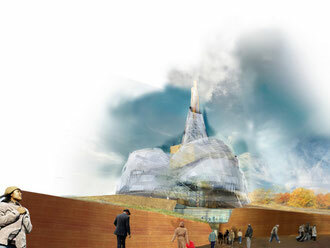 This will be a world class facility that will redefine the meaning of Museum. In fact, the Canadian Museum for Human Rights might have been more pragmatically named the International Learning Centre for Human Rights. In particular, the section of the museum that focuses on our past struggles hit me hard. Very Hard! Sophisticated technology brings to life a hologram image of a First Nations child reciting her native language in bed under the cover of night in an attempt to prevent her language passing from memory - as she and others were forbidden to speak their native tongue. I look forward to the day that I can take my children to the Museum and learn with them about our human rights heroes and our human rights struggles. My trip to the UK was fantastic. A special thanks to the Woodvale team who built the 'Spirit of Fernie': Simon, Amanda, Fay, James, Dr. Lisle, Mathew and Premyslaw. A great group of people to work with - innovative ideas and boat loads of enthusiasm! Also, thanks to Jim MacDonald who spent his Friday evening teaching me water maker repairs that I hope I never have to do. Thanks Jim! My focus will now switch back to family and training. Two months until race day number 1. Greetings from Sunny England! I'm in the UK right now helping with the finishing touches on my boat! It looks great. I went to the Southampton Boat Show today (one of the largest in the world) where I bought a 5,000 dollar water "maker" (slightly more than your average "MEC" water filter/maker), which is a necessity as past ocean crossings have proved that the water maker is usually the first thing to go. Let's hope that doesn't happen! To minimize the chance of mishap, I've named my water maker Brad. Brad is a close friend of mine who's greatly helped me on my quest (he's also a man who never breaks, and is a machine! (and now baby machine! (congrats to Brad & Lisa!))). However, I'm going to take a course on how to fix Brad when he breaks. I'm now at the Cash Manor in Kings Cross London; just 200 yards away from where Harry Potter took the train to Hogwarts on platform nine and half (I think). Tomorrow morning I head back down to Devon to install Brad!. A very special Thank You to Patrick Taylor and his wife Heather who helped me get on my feet in the UK. Another big Thank You to the Lyons family who graciously hosted me for dinner the other night. Lastly, a big thank you to "Team Commando" who've helped me in innumerable ways. Note: They are called the "commandos" not because they like going out in the "Buff" but because they are a pair of actual Royal Marine Commandos who are in the Race this year in the pairs category! Go Commando(s)! Training has been going very well. This past weekend, Joy (my 2.5 year old daughter) and I competed in a Mountain Triathlon. 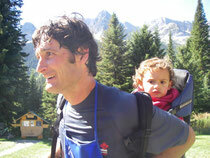 The 10.6 k mountain hike was enough for her and dad was happy to quicken the pace on the bike and run. The weather was perfect and a great time was had by all. 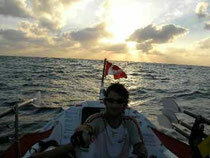 I am off to the UK to test my row boat and equipment. A special thanks to Richard Hayashi who helped with airfare. Please sign my Guest Book before you leave!!! !